In the air, there is little time for lengthy processes of reasoning. Decisions must be made quickly and accurately; therefore, careful planning is essential to any flight. A smooth, successful flight requires a careful step-by-step plan that can be followed from takeoff to landing. When planning a route to be flown, many factors enter into consideration. The route may be dictated by operational requirements of the flight; it may be a preplanned route, or the navigator may have the prerogative of selecting the route to be flown. In any case, definite factors affect route selection and the navigator must be aware of them. In most cases, a direct route is usually best because it conserves both time and fuel. Such things as airways, routing, high terrain, and bad weather, however, can affect this. The direction of prevailing winds can affect route selection, because the proper use of a jet stream often decreases total flying time, even though a direct route is not flown. Once a route is established, navigation charts appropriate to the intended flightpath should be selected. Correct selection depends on distance to be flown, airspeeds, methods of navigation, and chart accuracy. A great circle is the shortest distance between two points. Considerable distance can be saved by flying a great circle course, particularly on long-range flights in polar latitudes. A straight line on a gnomonic chart represents a great circle course. One way to flight plan a great circle course is to plot the entire route on a gnomonic chart, then transfer coordinates to charts more suitable for navigation, such as a Transverse Mercator. Select coordinates at intervals of approximately 300 nautical miles (NM). Once the route is plotted on the navigational chart, record true courses and distances for each leg of the flight on the flight plan. The method of navigation is determined by flight requirements and the route/area that is used. Select charts for the flight that are best suited to the navigational techniques chosen. For example, radar flights require charts with representative terrain and cultural returns for precision fixing and grid flights require charts with a grid overlay. 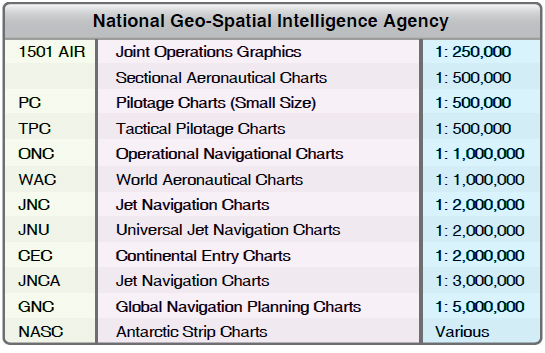 Charts produced by NGA are shown in Figure 2-1. Figure 2-1. National Geo-Spatial Intelligence Agency charts. The scale of charts used for navigation varies inversely with the speed of the aircraft. For example, Jet Navigation Charts (JNC) have a small scale and contain features appropriate for high speed navigation. Navigation at slower speeds requires large scale charts providing more detailed coverage. Interim aeronautical flight information changes are disseminated by NOTAMs until the change is provided in all pertinent FLIPs. NOTAMs also provide the most current information on restrictions to flight, reliability of airport facilities and services, en route hazards, radio aids, etc.